Instead of picking up my CSA veggies after work I ran to the store for pregnancy tests!! I couldn't help myself. (It was negative). Anyway! After the gym tonight I drove over to the pick-up location and since it's now dark I'll have to take photos in the morning. Don't fret though, this week's veggies will look quite familiar. Lettuce, MORE Roma Beans, FIVE humongous cucumbers (nooo! 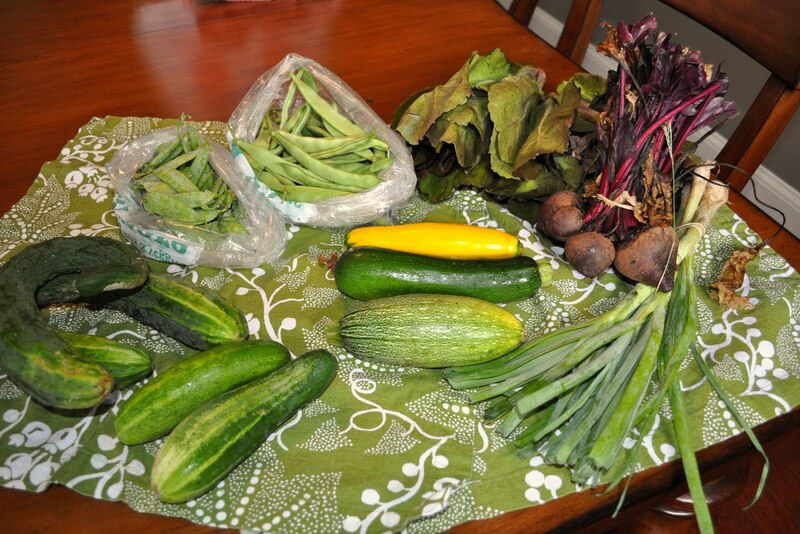 ), one teeny adorable yellow squash, SNOW PEAS (ugh), beets (I'm excited about these! ), scallions, and two zucchini! I'm going to have to either get creative or become generous in sharing my bounty. Anyone want some yummy snow peas or cucumber—or roma beans, for that matter? They are yours!! I didn't get around to using the Turnips (even though I have a delicious mashed turnip recipe I've been wanting to try), green onions, patty pan squash (it's still hanging on after two weeks! ), or butter beans. I've fallen behind! This pancake recipe is beside the point and requires no csa veggies, but mmmm I haven't had pancakes like these in a long time—and I've never made them from scratch—they are perfect!